When I was a freshman in college, my first test was an Anthropology exam – a seemingly straightforward exam that I had more than three weeks to prepare for. To me, it seemed like a piece of cake – and when it was two weeks and even one week away, I had the same feeling. After all, I’d been through this before in high school: study the night before, ace the exam, move on to the next one. And besides, I was having fun. I was in college and away from home for the first time. Going out with friends and having fun was my top priority; studying for the Anthropology exam could wait until the night before. However, college – as I quickly learned – was different. I ended up staying up all night studying before the exam, and at 4 a.m. that night, I realized that I was in no way, shape or form prepared for what I faced ahead. After a completely sleepless night, I ended up with a D on the exam…mostly due to not being sufficiently prepared, but in no small part due to the fact that I also had not had nearly enough sleep the night before. Apparently, I wasn’t alone. Recent Harvard research concluded that only 11 percent of American college students sleep well, and that 40 percent of students feel well rested only two days per week. Various studies show that college students average less than six hours of sleep every night – with many getting much less than that. Not surprisingly then, more than half of college-aged students say they feel tired during the day. We’ve shown how alcohol and other factors can affect the amount and quality of sleep that people are getting today. But don’t take our word for it. The state of sleep among students seems to be in dire straits, with young people increasingly at a high risk for not getting a sufficient amount of sleep. It’s not only busy social lives and ‘all nighters’ that are causing this deficiency. Between varying class times and demanding work schedules, sleep is all too often a low priority for students. Lifestyle and culture inevitably play a big role in this phenomenon, as the average college student is likely to cram late-night studying sessions in and around partying, other social activities, and pretty much anything else we’ve all done in college to put off something that’s of such ‘little importance’ as sleep. We recently posted about how sleep helps our memory. What we now know is that problems with insomnia and ongoing sleep deprivation have a whole host of negative repercussions: they can not only contribute to difficulty in logical reasoning and memory problems (something not to be taken lightly when exam time comes); but also interrupt physiological processes related to hormone function and blood pressure, and decrease students’ overall ability to concentrate and focus on their studies and coursework. Studies have shown, in fact, that students who don’t get enough sleep tend to have lower grade point averages, perform worse on tests, and get worse grades than other students. Inadequate sleep affects our acquisition, recall, and concentration – all of which affects the ability to focus on and gather the information presented to us. Additional research has even shown that sleep loss alters mood and social relationships as well. The conclusion for students is clear: sleep should not be thought of as a waste of time, but rather a time when our minds are doing some of their most important work. 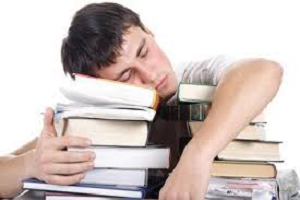 Students that make the extra effort to establish a regular sleep schedule can realize big dividends in the end. Although this change in lifestyle can be difficult for college students, making the extra effort to try and go to bed and wake up at approximately the same time each day can help the mind organize, sort, and store what was learned and experienced that day, making it easier to recall at a later time. Sleep also helps filter out irrelevant information and make connections between memory and the information learned, even if those connections haven’t been made while awake. But don’t take our word for it. Testimonials abound from students discussing the importance of getting a good night’s sleep. Whether it’s better time management, not drinking caffeine late at night, or setting a timetable where every hour is accounted for, students are realizing the power that sleep can have on their everyday performance and routine. Because sleep closely relates to so many aspects of student health and performance, improved sleep has the potential to improve both health and academic success. Students need a clear path to learning, remembering, and processing what’s needed to succeed and be productive throughout their days. At Sleeprate, we use the power of advanced sleep monitoring and assessment with the latest modern technologies, to create the most reliable, effective, and best sleep tracker available today. Sleeprate’s core technology utilizes behavioral sleep medicine practices developed and implemented at Stanford University’s Behavioral Sleep Division. Our unique sleep monitoring app for better sleep-life balance was developed and customized as a step-by-step program to improve mental and physical performance, so that people can be more productive and effective each and every day. The Sleeprate solution is also currently used at many universities across the U.S., including at MIT, and student health and wellness departments across the country provide it to assist students with various sleep-related problems. Sleeprate’s comprehensive all-in-one solution helps students and others achieve a better sleep-life balance and improve mental and physical performance – giving them the opportunity to be more productive and lead a healthier lifestyle. Sleeprate provides world-class technologies that offer people anywhere and everywhere the most effective, reliable and user-friendly sleep analysis, monitoring, assessment, and improvement around – all in a single solution.